Denver's small force of red light cameras and electronic speed traps poised to grow, but CDOT blocked police from putting them at crucial dangerous intersections - Denverite, the Denver site! “BS” is involved, according to one councilman. Dec. 05, 2018, 3:17 p.m.
Denver City Council members advanced a contract Wednesday that would add about $1.2 million to the city’s electronic traffic enforcement program for red light cameras at two new intersections and one new van to monitor speeds and ticket offenders. Some of the city’s most dangerous intersections won’t benefit from the safety measure, though. The Colorado Department of Transportation won’t let the Denver Police Department install cameras where cops think they can do the most good. The state roads department, which oversees some of the city’s deadliest streets because they double as state highways, denied red light cameras at Alameda and Federal, Colorado and Colfax, and Colfax and Monaco, according to DPD photo enforcement supervisor Ted Porras. The move is out of line with the city’s Vision Zero imitative to end traffic deaths. City Councilman Paul López called the denial “BS” during a Safety, Housing and Education Committee meeting Wednesday. He said CDOT’s decision poses risks to pedestrians in his westside district, where Federal Boulevard, a state highway, cuts through residential areas and transit corridors with heavy foot traffic. “Shame on CDOT if they can’t prioritize a route like this,” said López, who was the sole councilperson to vote against the contract. The city council and the mayor’s office previously denied López’s budget request for cameras at the particularly dangerous intersection of 14th and Federal, the councilman told Denverite. By preventing T-bone crashes (typically far more dangerous than rear-end crashes), red light cameras reduce the rate of fatal red-light-running by 24 percent, according to a study of dozens of American cities conducted by the Insurance Institute for Highway Safety. 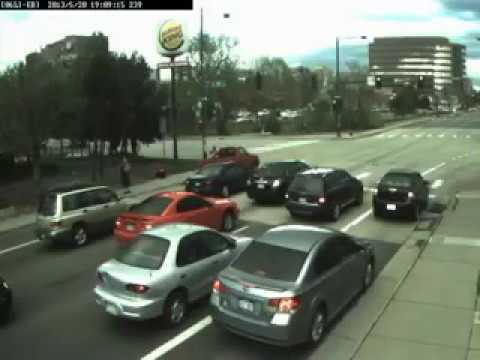 Cameras have changed driving behavior at “key locations” including Sheridan Boulevard, Monaco Parkway, Quebec Street, Colorado Boulevard and Lincoln Street, a DPD report states. Denver drivers blow through reds a lot. At just one intersection — 13th and Lincoln — drivers ran the red 151 times in one day on October 29, according to DPD data. New cameras will be deployed at that intersection and at Alameda and Santa Fe, where drivers blew through reds 108 times the same day. A day after this story was published, CDOT responded to a request for more information on the department’s denial. According to CDOT, two of the three intersections in question did not see enough T-bone crashes to warrant red light cameras. Colfax and Monaco might warrant cameras, CDOT spokeswoman Tamara Rollison said, but the roads department wants to see Denver cut back vegetation, adjust signal timing and add a signal to curb T-bones before approving cameras. At the other two intersections, the department claims red light cameras could increase rear-end crashes. There is “no evidence” to indicate red light cameras would make the intersection safer for people walking and biking, Rollison said. Maybe. The fact that CDOT even lets Denver enforce the law electronically is a win, apparently. Virtually every year, Republicans in the state legislature pitch a bill to outlaw electronic enforcement, even though Denver’s human traffic enforcement officers are down to 50 (from 120 in 2005), according to DPD. One law on the books requires speed-monitoring vans to be manned by an officer. “I think we are at risk of the state shutting down our ability to have photo enforcement at all, which is always a line we are walking,” said Skye Stewart, legislative director with the mayor’s office. The Hancock administration’s data-driven Vision Zero plan to end traffic deaths shows where crashes end lives — 5 percent of streets account for half of Denver’s traffic deaths. Many are state highways under the control of CDOT, which is listed as a partner in the plan. If the full city council passes the contract, Denver’s electronic traffic enforcement program will include six red light intersections and six photo speed vehicles. A comparison of similarly sized cities: Washington, D.C. has red light cameras at 44 intersections, Seattle has 23 intersections monitored by red light cameras; Austin has 10. This article was updated to correct the name of the council committee, and to include comments from CDOT.